“Swim – Wetsuit swim, which suits me, temperature was fine. I feel that I got off to a great start in the swim was around the first lap in the top 20’s then lost a few places on lap 2. It was a good long run up towards transition which helped the body to get ready for the first challenge, of straight up a sharp incline. “Bike – I found the hill fairly comfortable keeping a nice fast cadence to keep the legs from feeling up to quickly. The 14k down to the city was fast and furious. Head down full gas. The field was being splintered by the fast pace that was being set at the front. Within 2-3 mins groups were forming which then turned into the chase pack. On reaching the city you could here that it was in Britain the crowds up and around transition were incredible, the noise was deafening but at the same time was a massive up lift. 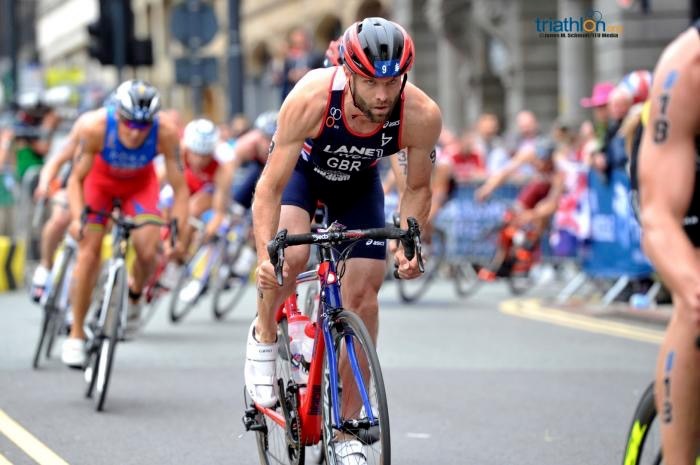 “T2 – was a little messy, felt like people had forgot which side there bikes were on causing a crash to happen just as we had dismounted our bikes. Luckily I was able to miss it at rack my bike fast as I had a reasonably quick transition. “Run – As soon as I got into my running my legs were feeling good, so I decided to push the pace on with Gomez alongside me for company. Within a about 2k me and Gomez had broken the group that headed out with us. My plan now was to keep the hammer down it was a course that took the bounce out of your legs, with some sharp little inclines which was suiting me well. Gomez continued with his fast pace which I was trying to hang onto but failed. The rest of the laps felt tough but I was only over taken by Pier lecore over the last 2 laps. 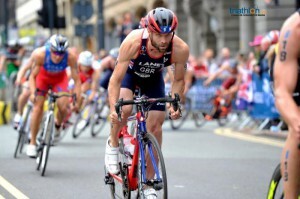 I was certainly feeling the last lap but the crowds kept me strong, so much support for the British athletes. I crossed the line in 7th, it was a great feeling to be back up towards the front end of a WTS field.